The original metal waterfall bridge was built in 1937 by three employees of Colonel Doig of Ardvarna who, at that time, had the fishing rights of the salmon pool at the waterfall. The three were Tom Dixon, Steve McDonagh and a Mr. Donnellan. In relating this history, the late Pat Gibbons presumed that the materials came from the Iron Foundry in Galway, and consisted of single span girders and walkway with metal slats and handrails with supports – a pretty simple construction. When Colonel Doig died and Ardvarna was vacated, the fishing rights were taken on by Dr. Bushe, Doctor of Law, at Waterfall Lodge, and who now owned the bridge and the field on the opposite side of the river. There was a right-of- way already in existence and the river crossing was by way of a wooden footbridge and stepping stones a little further upstream. Earlier still there might have been a ford just below Dr. Cotter’s house. Dr. Bushe must have been contemplating leaving because, in 1953, he handed over the rights to the bridge and the right of way approaches to a trust of nine somewhat republican members, one of whom was Pat Gibbons. All have now passed on. The bridge was falling into disrepair and becoming dangerous in the sense that the handrails on both sides of the river path were rotten wood and had been vandalised. He communicated the above facts to the chairman of the Heritage Council, which was set up by Charles Haughey, and he was advised that it was possible that the Heritage Council might be able to use its influence to have the bridge put into good order. There was a residence above the waterfall bridge called Persse House which belonged to the O’Flaherty family – a Major Gascoigne had the lease of this house and Mike O’Farrell lived in a round house at the southern end of the present waterfall bridge. He was a caretaker for Major Gascoigne. 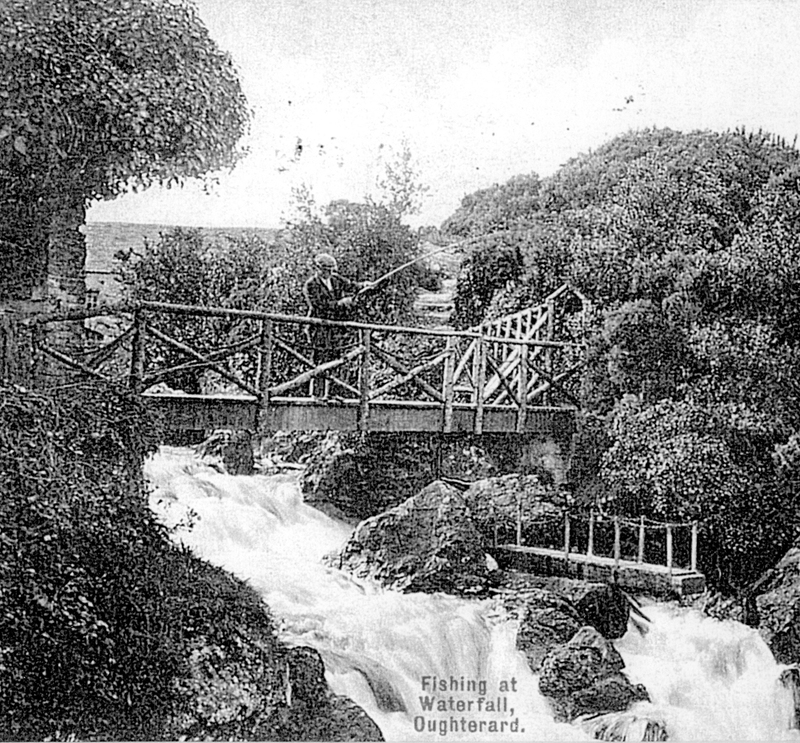 Based on a survey of the whole Oughterard water area by the British Fishery Conservation Authority around 1850, it was decided to build a salmon hatchery below the waterfall. The principals involved in building the hatchery were Messrs Doig, Jackson and Henry Hodgson. It was fed by a duct of timber construction from the waterfall and some of this work is still to be seen at the rear of the hatchery. It was a very effective and useful hatchery at the time and considered to be a very modern concept. The spa well is contained in Mr. McHugo’s property to the south west of the river and is accessible to everyone.